This page describes the fourth step of creating a backup task with the New Task Wizard. On the fourth step of the New Task Wizard, you need to select type of backup and versioning options. Advanced users can also change comparison settings and error handling settings (read below). Full backup copies all files from backup set to selected destination. If target folder already contains some backup files, they are overwritten. Incremental backup compares files in destination and files in backup set, and copies only new and modified files. It is faster than full backup, because existing backups are not overwritten. Mixed incremental backup is a sequence of a full backup with a continuous chain of incremental backups. When the program reaches the preset quantity of backups (defined by a time or by a quantity of incremental backups), all chain repeats from start, making again a full backup and next cycle of incremental backups. Mixed differential backup is a combination of a full backup with a chain of differential backups. When the program reaches the end of a chain (defined by a time or by a quantity of differential backups), all chain repeats, starting with a full backup again. 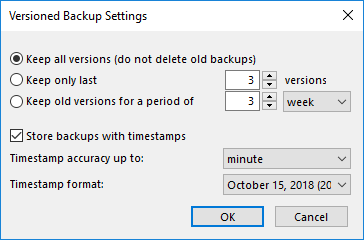 For full backup with versioning, you can click the Versions rotation settings... button to specify how many versions of backups you want to keep. This dialog can also set a quantity of mixed backups kept by the program before considering old mixed backup cycles obsolete. 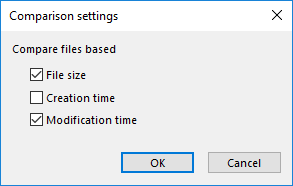 By default, when running incremental or differential backup, the program will create a new version of file if File size or Modification time attributes are different. Creation time is not checked, because some storage file systems (for example, FTP) don′t have this attribute. This behavior is task-specific, i.e. it can be different for different tasks. To change it, click the Change button in Comparison settings. Critical errors are plug-in specific. For example, failing to initialize Volume Shadow Copy service in MS SQL plug-in is a critical error, while in Computer plug-in it is not. 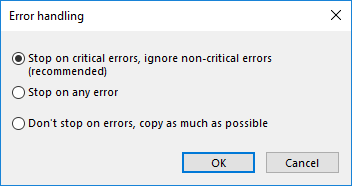 Non-critical errors are one-time errors that are not specific to the entire backup set. For example, the “Access denied” error may be a result of a conflict with another application, and running the same task again will back up the same file successfully. You can choose whether the task must stop on any error, stop only on critical errors, or don′t stop on errors at all. If there are any errors during backup, the task will end with an Error status. 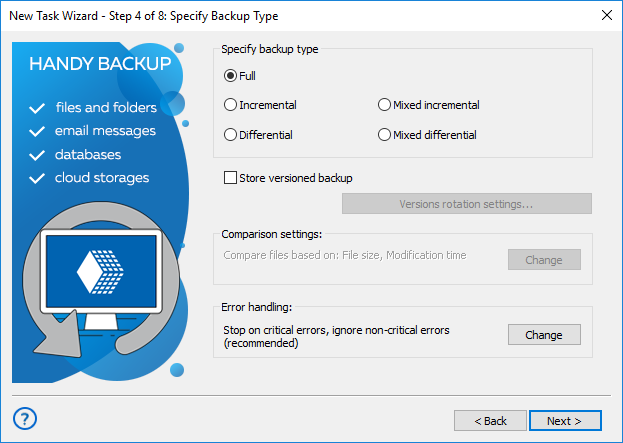 When finished selecting type of backup and specifying advanced settings, click Next.